Packaged Water Bottles 200 ml to 2 liter With and Without Tray. Our renowned company is considered amongst the prominent manufacturer and supplier of the best quality Automatic Shrink Packing Machine. Suitable for large quantity shrink wrapping industries such as software products, foodstuff, cosmetics, printing, pharmacy, flooring, ceramics, beverage. The card bord bolts could be transported by the inlet conveyor to the main packing unit for both width and side sealing through polythene film. The machine offered by us is developed employing modern technology in adherence with the latest industrial standards. This machine is provided in different specifications to meet the demand of customers. On the completion of side sealing, the packed cardboard bolts could be transferred to the heat chamber to crimp the polythene tightly over the cardboard bolts. 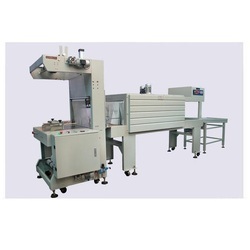 Looking for Automatic Shrink Wrapping Machine ?